The Workers' compensation is a workers compensation law poster by the Minnesota Department Of Labor & Industry. This is a mandatory posting for all employers in Minnesota, and businesses who fail to comply may be subject to fines or sanctions. This poster must be posted in a conspicuous place where all employees will see it. This poster describes what to do if injured in the workplace as well as what workers' compensation will pay for and what insurers must do if a claim is filed and what an employee filing for workers' compensation can do and who to talk to if their claim is denied. It appears you don't have a PDF plugin for this browser. 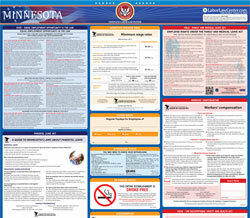 Please see the link below to download minnesota-workerscomp-poster.pdf. as short as 14 days. ■	Get any necessary medical treatment as soon as possible. ■	Wage-loss benefits for part of your lost income. function of a body part. same intervals as your work paychecks. written notification when they request the information. you sign a written authorization. result of a work injury. benefits are not related to your injury. August 2017	Posting required by law in a location where employees can easily see this notice.